What do you greet the world with each day? What is the tell-tale sign of confidence and the spark of positivity? What grabs the attention of others, sets an uplifting tone, and helps nourish your body with the food you enjoy? That’s right — a smile. There is so much power in a smile; that is why our team here at TeethNow understands just how important a smile truly is. Patients come to us with cases ranging from one missing tooth, to a full mouth of missing teeth. There are many reasons for missing teeth that vary from person to person, some of which include Periodontal Disease, tooth decay, injury and/or poor oral hygiene. By way of our specialized smile restoration procedures, we guarantee that our patients will leave our office with a fully functioning, permanent set of teeth. In addition, they will gain the power of a smile for the rest of their lives. Many patients, however, are told that the types of options we offer to them are not a possibility for them personally. Often times, they have been told by other doctor’s that a full smile restoration is not possible and never continue trying to find a solution. 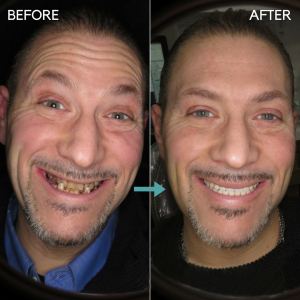 Our patient, Brian Prutkin, did not give up after being told he may only qualify for a denture. When he came to TeethNow, we evaluated him and immediately gave him the option of an All-On-Four. 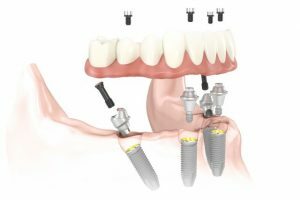 We explained that the All-On-Four procedure would provide him with a permanent, implanted fixed bridge that will be set into his top and bottom jaw. This All-On-Four would restore Brian with the confidence he once had, and more importantly, it would give him the ability to carry out the daily functions he had lost the ability to carry out for quite some time. For many years, Brian was afraid to come to the dentist. His case was beginning to infringe upon his daily life and effect the way he was living from day to do. Brian explained to our team at TeethNow that he simply wanted to be healthier and feel better about himself. Once Brian took the first big step towards his transformation, our team went ahead and took all the x-rays, photos, CT Scans and impressions they needed to begin Brian on his All-On-Four journey. Using the latest technology, TeethNow is able to prepare the implants and fixed bridges to perfection, prior to the day of surgery. Because of this, we are able to perform the All-On-Four procedure in just one visit, allowing our patients to leave the office with their brand new smile in just one visit. 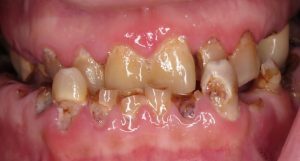 ‘Out with the old and in with the new’ was the exact protocol we followed as we swiftly removed the remaining, decayed teeth, replacing them with a full set of functional teeth. To see Brian’s transformation first-hand, enjoy this video we have prepared for all patients who were once in Brian’s place. Change can be a scary thing, but the end result is well worth the apprehension. Rid yourself of discomfort, eat with no worry, speak what’s on your mind, and smile with confidence! Call (212)843-4444.